The well-known international survey on adult skills PIAAC excluded institutionalised population (such as incarcerated adults, armed forces etc.) from the sample frame. However the National Centre for Education Statistics in corporation with U.S. Department of Education and Institute of Educational Sciences conducted in 2014 a separate survey focused on incarcerated adults based on the PIAAC methodology. This summary contains key findings from the report on this survey that focused on the skills, work experiences, education, and training of the surveyed inmates compared to household population in the USA. 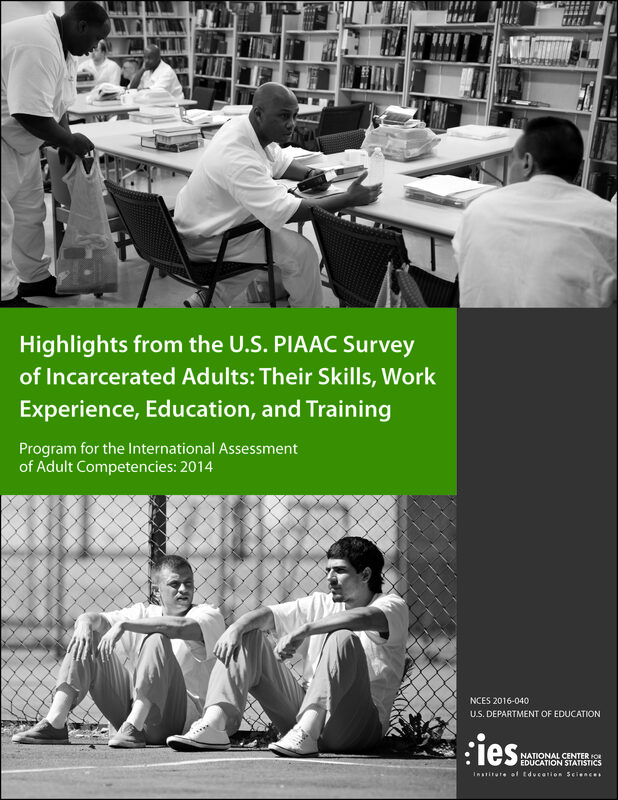 The report Highlights from the U.S. PIAAC Survey of Incarcerated Adults: Their Skills, Work Experience, Education, and Training was prepared by the National Centre for Education Statistics in corporation with U.S. Department of Education and Institute of Educational Sciences after the implementation of the U.S. PIAAC Survey of Incarcerated Adults. The U.S. PIAAC Survey of Incarcerated Adults was conducted from February through June 2014, and targeted a nationally representative sample of incarcerated adults (age 16 to 74) detained in state and federal prisons, and in private prisons housing state and federal inmates. In total, there were 98 participating prisons (80 were male-only or coed and 18 were female-only). Of the 1,546 sampled inmates, 1,315 completed the prison background questionnaire (1,048 male and 267 female). The prison survey was part of a second round of U.S. data collection, known as the 2014 U.S. PIAAC National Supplement. Survey PIAAC is designed to assess adults over a broad range of abilities, from simple reading to complex problem-solving skills, and to collect information on individuals’ skill use and background. PIAAC defines four core competency domains of adult cognitive skills that are seen as key to facilitating the social and economic participation of adults in advanced economies: literacy, reading components, numeracy, and problem solving in technology-rich environments. Tasks developed for PIAAC’s four domains are authentic, culturally appropriate, and drawn from real-life situations that are expected to be important or relevant in different contexts. PIAAC is not designed to provide individual scores, but rather to measure how groups of adults perform on the domains. Incarcerated adults were tested with the same assessments as those used for the national administration of PIAAC in households in 2012 and 2014. Inmates also responded to background questions that were similar to the household questionnaire given to the national sample of adults, but modified to more closely align with the experiences of the prison population. The survey was designed to provide information to policymakers, administrators, educators, and researchers who are developing education and training policies and programs for incarcerated adults. The purpose of the report is to introduce selected findings from the U.S. PIAAC Survey of Incarcerated Adults. While these selected findings do not represent a complete review of all observed differences in the data, they do provide a broad overview of the results and suggest potential avenues for future research using this rich dataset. The report explores the relationship between the background characteristics and cognitive skills of U.S. prisoners across a variety of dimensions. It also compares their demographic profile and skills with those of the U.S. household population. The key findings that are presented in the report are summarized below. The survey showed that the demographic characteristics, such as gender, race/ethnicity, age intervals, birthplace, highest level of educational attainment, of U.S. incarcerated population are significantly different in many respects from the general population of adults in U.S. households. It turned out that the U.S. incarcerated population had lower average literacy and numeracy scores than the U.S. household population. 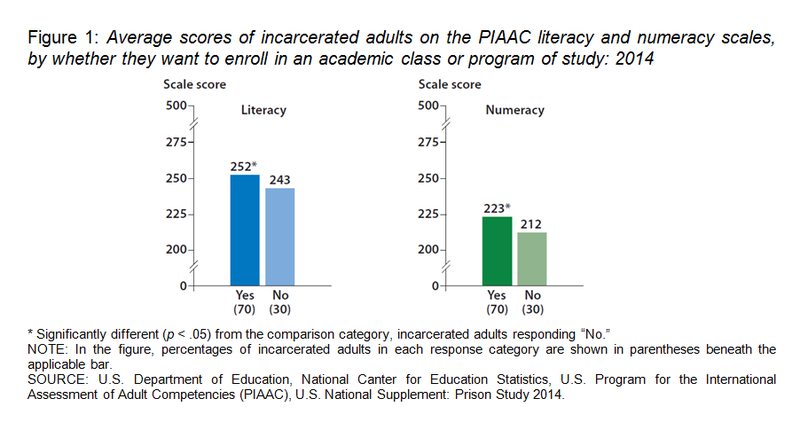 Percentages of incarcerated adult below level 2 on the PIAAC literacy scale is 29 % and below level 2 in numeracy is 52 %, while percentages of adult from household below level 2 on the PIAAC literacy scale is 19 % and below level 2 in numeracy is 29 % (Table 1 and Table 2). Average literacy scores were not measurably different between incarcerated adults and their household peers with the same level of educational attainment (Table 1). In numeracy, incarcerated adults whose highest level of educational attainment was a high school credential scored lower on average than adults living in households with the same level of educational attainment. The same was true when comparing the average numeracy scores of those with less than a high school credential (Table 2). The survey asked prison inmates a series of questions related to their work experience prior to their current incarceration, their work experience during their current incarceration, the skills certifications that they had earned (in or outside prison), and the frequency and types of skills they use in their current prison jobs. Based on the answers to these questions, some of the survey’s findings are summarized below. Around two-thirds (66 %) of the survey’s respondents reported that they were employed prior to their incarceration and 61 % reported currently having a prison job (Table 3). 48 % of younger prisoners (18- to 24-year-olds) were employed prior to their incarceration and 50 % reported currently having a prison job. Among 55- to 65-year-olds, 70 % were employed prior to their incarceration and the same percentage reported currently having a prison job. Incarcerated adults with higher levels of education were more likely to have a prison job: 48 % of those having less than a high school credential had prison jobs, compared with 73 % of those holding Associate’s degrees (Table 3). Incarcerated adults with a prison job scored higher on average in literacy than their peers without a prison job; however, average numeracy scores were not measurably different. Many incarcerated adults reported never having to use their literacy or numeracy skills in their current prison job. The survey also asked prison inmates a series of questions related to academic and job training programs that they were participating in. Based on the answers to these questions, some of the survey’s findings are summarized below. 42 % of incarcerated adults completed some level of formal education during their current period of incarceration. Over two-thirds (70 %) of incarcerated adults wanted to enrol in an academic class or program (Figure 1). Among incarcerated adults who wanted to enrol in an academic class or program, 80 % wanted to do so either to learn more or to improve their job prospects after they are released. Incarcerated adults who wanted to enrol in academic classes or programs of study scored higher on average in literacy and numeracy than their peers who did not want to enrol (Figure 1). 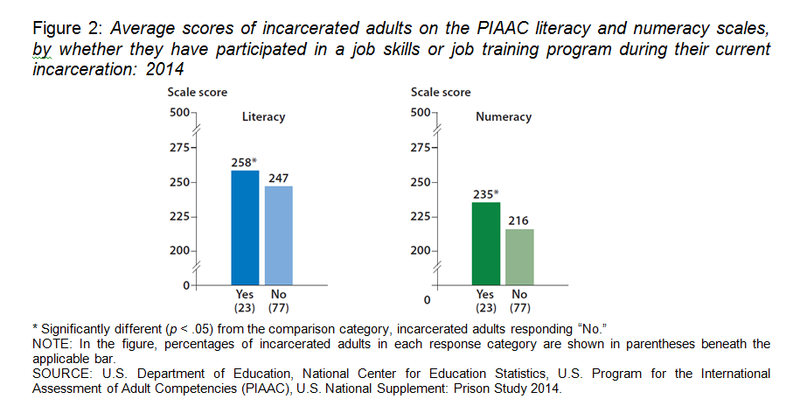 23 % of incarcerated adults participated in job training programs during their current prison term and those who participated scored higher on average in literacy and numeracy than those who had not participated (Figure 2). Since this US survey on skills of prison inmates is the only comparable survey it is worthwhile to point out some of the findings that could be relevant for the Transnational prison up-skilling guidance and training model SkillHUBS project goals which are among others equipping the prison inmates with basic and transversal skills that will enable them more equal position in labour market and everyday life after their release. It is expected that prison population has lower literacy skills and numeracy skills than general population, and the survey confirmed that. However, the survey pointed out three important factors that contribute to the level of skills: the initial level of education, skills use and participation in education and training. The PIAAC study of the prison inmates in USA showed that the average literacy scores were not measurably different between incarcerated adults and their household peers with the same level of educational attainment. And also that incarcerated adults with higher levels of education were more likely to have a prison job. Incarcerated adults with a prison job scored higher on average in literacy than their peers without a prison job, although, average numeracy scores were not measurably different. And as regards participation in education, incarcerated adults who wanted to enrol in academic classes or programs of study scored higher on average in literacy and numeracy than their peers who did not want to enrol. The data showed that 23 % of incarcerated adults participated in job training programs during their current prison term and those who participated scored higher on average in literacy and numeracy than those who had not. Katja Kragelj is employed at Research and Development Unit of the Slovenian Institute for Adult Education, where she works on development tasks on literacy field. Mag. Estera Možina is a researcher and developer of adults' literacy programmes at the Slovenian Institute for Adult Education since 1991. Among other things, she was the national coordinator of the IALS research in 1997-2000, and since 2013, she is a national coordinator of the PIAAC research in Slovenia. While the PIAAC target population was 16- to 74-years old, the prison sample does not include 16- or 17-year-olds. PIAAC- Prerequisites for success in work and in life. Results of the OECD PIAAC International Survey of Adults.